Portland, OR to Kelso, WA? I see the Seattle to Portland bike ride uses the west side of the river from Kelso to Portland. But a route on the east side is slightly shorter. Which is the better of the two routes? US 30 on the Oregon side has heavy traffic, but it has wide shoulders, too. The route also stays in the Columbia River Valley - so it's a level ride with prevailing northerly winds. But the bridge into Kelso isn't fun. Doable, narrow, steep, heavy traffic. The I-5 corridor on the Washington side is more difficult since the Old Pacific Highway isn't thru. From Woodland to Kalama you have to take Green Mountain Rd - note the name. Extra miles, lots of climbing - - unless you want to ride on I-5 which is legal, but. Thanks. Sounds like it is not a very pleasant ride then? I will be touring Mt Hood and the Columbia River Gorge. After I want to get to Lacy to visit a friend. Then on to Seattle to catch the Empire Builder back home. I wanted to ride all the way to Lacy but time might not allow it. I kind of like the idea of at least riding to Kelso so I can cross the Columbia then catch the train to make up time. But it sounds like it isn't worth it so I might just catch the train in Portland. Unfortunately your choices are highways with wide shoulders and fast traffic and 2-lane blacktops with 0-6" shoulders and still pretty fast traffic that runs you off the road on blind corners. I've done I-5 from Ridgefield to Tumwater a couple of times. About 100 miles starting from Vancouver. HWY99, 20th Ave, 15th Ave, 10th Ave (get fish and chips and beer at PNW Best Fish Co.), S. 5th St, then jump on I5 at Pioneer St.
Or you can just do some nice Portland to Vancouver ride, get on the train at Vancouver, Off at Centennial station , then do a loop out to Nisqually, then back into Lacey. Oh thanks for that. Vancouver might work better. 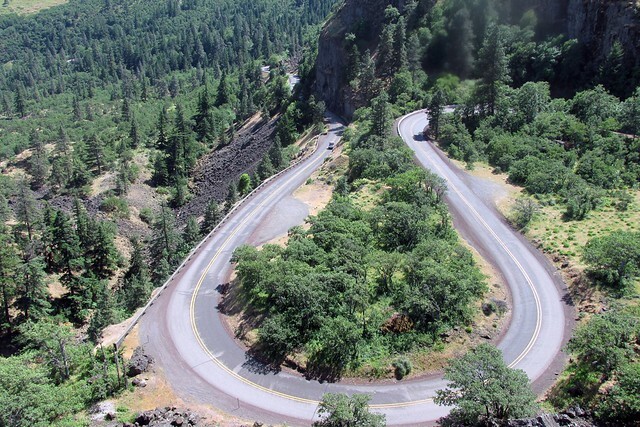 I would be coming from Hood River via the scenic highway (which is fianlly open though I understand it has been open for a while but just bikes ;( ). To get to a hotel near the station, that puts me slightly over my comfort range as far as miles. Vancouver gets me a bit closer plus I get to cross the Columbia! And I have never been to Vancouver. Only downside is it might cause me to miss the rail museum again. Which I missed this year due to the fact Delta got me into Portland so damn late. You do know that riding from Hood River TO Portland may involve killer headwinds ?? I rode mostly on 30 from Portland to Scapoose. Generally wide shoulders, but whew, that road is BUSY, with big trucks!!! Looking at the map, there appear to be quite a few secondary roads, but that could mean a lot of elevation changes, and most of them don't appear to be very straight. And, they could also be narrow with traffic. Still, if you are having a fun "tour", perhaps zigging and zagging would be fun. One issue, of course, is running into places where roads just don't quite meet, or send you off on a several mile loop to make a simple crossing. Oops have that backward again. I thought it was the other way around. Guess I will just have to switch my itinerary around. So just to be clear (and I know I have been over this some place before). In the summer the winds blow down river toward the ocean? It looks like a lot of east winds right now, but I think that is right, west winds in the summer. Does the wind direction/intensity change during the day & night? I've ridden between Portland and Kelso three times in the last decade, always part of a longer tour. I look at Portland-Kelso as a "getting to somewhere else" ride vs a ride in itself. I pretty much agree with the assessments made by other commenters regarding the different route options. I've done them all: Oregon side via 30/Longview Bridge, Washington side via Green Mtn Road between Kalama and Ridgefield, and Washington side via I-5 between Kalama and Ridgefield. Of those three choices, I liked the WA/I-5 one the best. If I do a tour north towards Seattle again (and I probably will) I'd opt for that route. But the better riding would definitely be north of Kelso-Longview. No need for a loop. The plan is to end the trip in Seattle. I will likely cross at Ruston. Shorter route plus that give me two ferries, which I like riding ferries. And the wind does blow down river in the summer correct? And what about getting from the end of Weth Road to Hood River? I can ride I84 there correct? Or should I cross at Cascade Locks and take 14? But I do not think I am allowed on the bridge into Hood River right? Prevailing wind in summer is out of the west (from ocean), winter from the east (from interior.) Right now in Portland we've got a steady 25 mph wind coming out of the Columbia Gorge, which makes any eastbound bicycle ride a downright chore. It looks like a lot of east winds right now, but I think that is right, west winds in the summer. Does the wind direction/intensity change during the day & night? During the summer, the wind picks up late morn/early afternoon, intensifies as sunset nears, and then dies down a bit after sunset. The best strategy for a westbound summer tour in the Gorge is to get going as early as possibly (before/at sunrise) and end day around noon. Of course, I never seem to follow that strategy myself, and end up having to exert maximum effort to even go downhill! 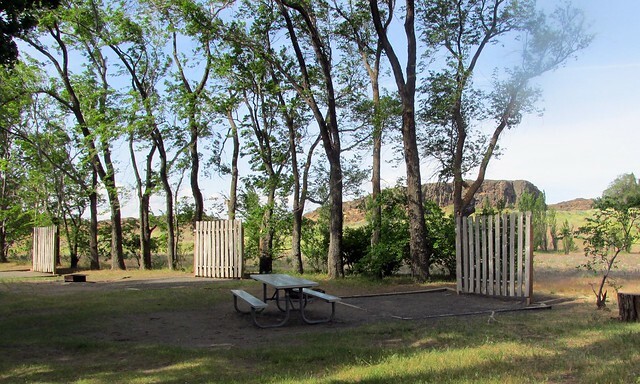 As a visual demonstration of Columbia Gorge winds, here's a pic from the campsite at Horsethief Lake (Columbia Hills State Park) in Washington, across the river from The Dalles. Those "fences" are windbreaks for the west wind. Do you mean Wyeth Road east of Cascade Locks? If so, yes. It is legal to bicycle on I-84 from Troutdale east into Idaho. You cannot bike across the Hood River Bridge, bikes and pedestrians are prohibited. (Though I've hitched with bike a few times.) You can cross west at Cascade Locks/Bridge of the Gods and east at The Dalles. As for SR 14, would you be traveling west of Cascade Locks on it, or east? Last edited by spinnaker; 12-06-18 at 06:59 PM. So then I was right the first time? In the summer I want to come from Hood River into Portland correct? You mean travel west from Hood River into Portland? If you want a headwind, yes. What if I wanted to extend my trip and go further east to the Dalles? Is it worth it? Road looks awfully narrow. I just fixed my post. I read it backward. I can be a bit dyslexic at times. 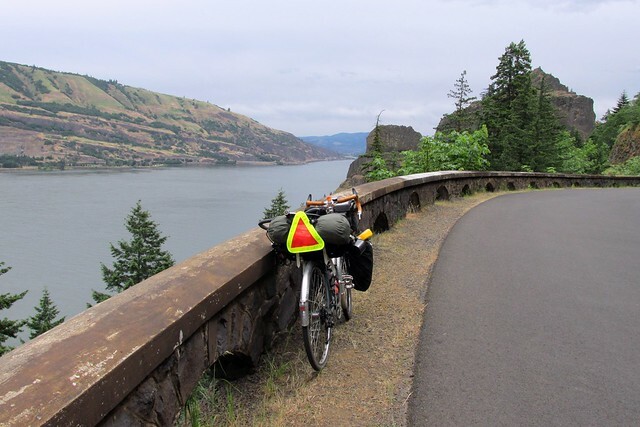 Going from Hood River to The Dalles on the Oregon side would consist a bit of the Historic Columbia River Hwy State Trail (Mosier Twin Tunnels section), which is great. From Mosier to The Dalles is on US 30, which isn't the widest road, but most of the traffic is on I-84. It's a worthwhile ride if you have the time and very scenic. 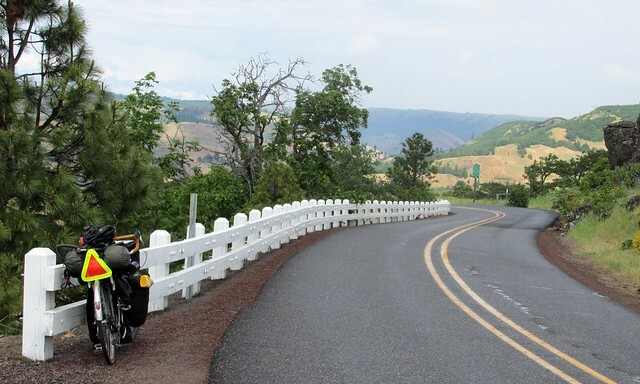 US-30 between Mosier and Rowena. Those curves look really cool. Did you take that shot from another part of the road? Or did you climb somewhere to get it? Looks like a nice wide shoulder there but the section I saw with google earth showed a very narrow road with sharp curves. No problems with a car coming flying around a sharp curve into you? I was thinking of at least riding to Mosier tunnels and back. The problem is when to do it. I would likely want to do it the day I arrived in Hood River but that would be my first day out and not sure how I will feel about doing another 12 miles with 6 miles back into the wind. I could make that trip 2 short days with a stop in Cascade Locks first. Photo taken from the viewpoint on top. There's no shoulder there. But there's little traffic, and sightlines are good. Humm I am thinking it might me worth it to stay an extra night in Hood River, take a ride up toward the Dalles for the day for as far as I feel comfortable bucking the wind on the way back. I don't suppose there is public transit from The Dalles back to Hood River? Or I wonder if one of the bike shops in Hood River can provide a shuttle? I could go all the way to The Dalles if only I could get a ride back to Hood River for the night. I don't suppose there is public transit from The Dalles back to Hood River? Can't you have the decency to wait a few minutes for me to respond to your post before you Google this information for yourself?